Well, after many requests for this fella, here he is. Goomba from Mario Brothers. My girls have already laid claim to him, altho now they're arguing over who gets to keep him in their room. As always, the pattern is here, and if you have any questions or problems, let me know I'll try to answer as quickly as I can. This doll really needs weight in the base due to it's naturally top-heavy design. I used unpopped popcorn (it's a bit heavier than dried beans) or you can use the plastic pellets they sell at craft stores specifically for this purpose. Numbers at the end of each round/row indicate the total number of stitches that should be in each round or row. Begin stuffing and shaping the mushroom body here and continue stuffing and shaping as you progress. The body should be stuffed fairly firmly to help maintain the desired shape. F/O leaving long tail. Fill 3/4 full with weighted material (pellets, popcorn, beans, etc) Stuff the remained with fiberfill firmly sew to the bottom of the body (using the rounds of crochet on the body to help center the stem) using the long tail and add any more stuffing that may be needed to shape the base and hold the weighting material firmly in place. You may find you need to flatten the very bottom of the of the stem a little, but this shouldn't be too difficult as the weighting materials are much more forgiving than fiberfill. Embroider the mouth as shown using a small amt of WW black yarn and yarn needle. From white felt, cut two small 'fangs' and place as shown. From black cut the eye 'pupils' and eyebrows and place as shown. Sew the eyebrows so that the upper ends are extending off of the face about 3/4 of an inch or so. Add two very smal circles of white to the black pupils at the positions shown for catch-lights in the eyes if desired. Mario Brothers and the Goomba Mushroom character is copyright Nintendo. This crochet pattern is an original pattern by Linda Potts (June 2009). Please do not claim this pattern as your own. If you wish to share this pattern, you may link to this pattern but please do not reprint it on your site. 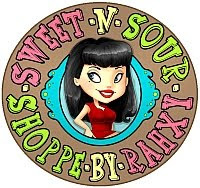 You may keep a copy for your own personal use but you may not sell or distribute it, or sell items made from this pattern. These are so awesome, I love your patterns, you really do a nice job! Your patterns are sooo great! 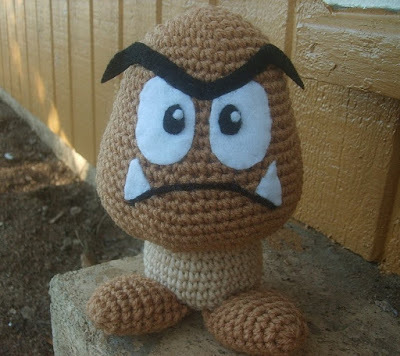 I love the Goomba, I made from this pattern! Really love your patterns. Any hints about adding facial features?? hi i live in south africa and i love your patterns. I have a pattern for mario and luigi and princess peach, but i dont have one for princess Daisy, poor luigi is going to be all alone with no lover, if you can desine a princess daisy it will be fantastic P.S. are you a Christian? I love your Mario Bros. patterns! As soon as I get to the craft store I am buying yarn to make every one of them!...I was just wondering...How tall is Goomba? He looks kinda big?! Thanks for all the Mario Bros. pattern...I LOVE THEM!! Thanks! The exact size varies with your hook/yarn choices and of course your individul tension/gauge, but mine came out around 8 and a half inches tall. I love this my kids love this.. You are AWESOME...My boys made me make them a(n)army of Goombas. Brown ones and Blue ones and Goomba's with the wings. After making SO MANY (cause the 3 boys insisted on this.I noticed on the base which connects to the head I used 1sc in next sc then dec over 2 sc seemed to help him stand up better. Once again my kids think you RULE!!!!!!! this is an amazing pattern - easy to use and the final product is adorable!!! i started toad already... you have the best patterns! i've been working on these guys during finals, so thanks for making my study experience better! I'm not sure what you mean by embroider the mouth like the pic. I can't tell what you did from the pic. could you please explain? You have some amazing patterns and great work! Mario and Luigi are getting bored and lonley. The Bombombs, Chain-Chops, Goombas, Boos, and King Boo are leaderless and crazy. The 3 fireflowers have noone to place them. Toad has nothing to clompain about (besides that he cant open the peanutbutter or something else stupid) and toadette has noone to help her learn music, and worst of all, the lumas have no mama! :( so, i was wondering if you could create a Peach, Daisy, Bowser, and Rosilina crochet patterns so that i wont be afraid to sleep anymore. Please help, im starting to think that they have found a way to work together and kill me in my sleep. Thanks! Well I understand what you're saying, but these free patterns, I make them as I can. I do these in my free time and with what materials I have available.. so if I don't have the right colors of yarn here, I just make whatever I have the right colors for. I seldom will buy yarn to make a free pattern... I simply can't afford that, (most of the time). I am, unfortunately, at the mercy of the economy like everyone else. LOL. I also don't generally make 'human' type dolls, altho I have made a few, it's not my norm. I tend to the 'animal' styles more than anything. In the meantime, I think there are patterns on Ravelry you might can check out... I'd search them out for you, but honestly, I'm running low on time cause I have to be at work in just a few minutes. I was wondering to you plan on making Bowser? I would definitely pay for him. Your patterns are amazing thanks for sharing. You have make my childern so happy. Going to crochet this as my first attempt to completely follow a pattern! This is still great, though. Thank you so much! So cute! This is one of my favorites. I love all pf your Pokemon plushies, too. I love your patterns! It was thanks to stumbling over your Mario Mushrooms I even learnt how to crochet properly (the downside to that is that I can't crochet in my first language anymore). For a heavier material I usually use rice, but I dont know if that works with a larger gauge (I use a 2.5 mm hook)... gives the figure a great wheight, very useful for eg. Jigglypuff, the mushrooms and Aipom's tail-hand-thing. ^^ Keep up the good work and I am forever grateful for the free patterns! Without them I would never have "found" crocheting. Um, I wanted to know what's the size of the Goomba. I've already made the pokeball and the cyndaquil. Hello! very well explained! I'm from Brazil and I managed to do it! :) loved it!tenks! Hi. I have adapted your pattern for a little boy who likes the Electro Goomba.